Raben Tire operates multiple retreading facilities that manufacture Goodyear and Oliver retreads. Raben also offers Michelin retreads as an associate dealer. For more information on retread tires and to have a representative contact you, click Connect With Us below and we will contact you shortly. Retreading is the process where selected and inspected worn tires, called “casings”, receive a new tread. Only sound, carefully inspected tire casings are used for retreading. The worn tread is buffed away and a new tread bonded to the tire body in a process very similar to the manufacture of a new tire. There are different processing techniques, but the ultimate objective is always the same – affixing a new tread through the application of heat, time and pressure. Tire retreading is an established industry that began in the early 1900s and has grown steadily. 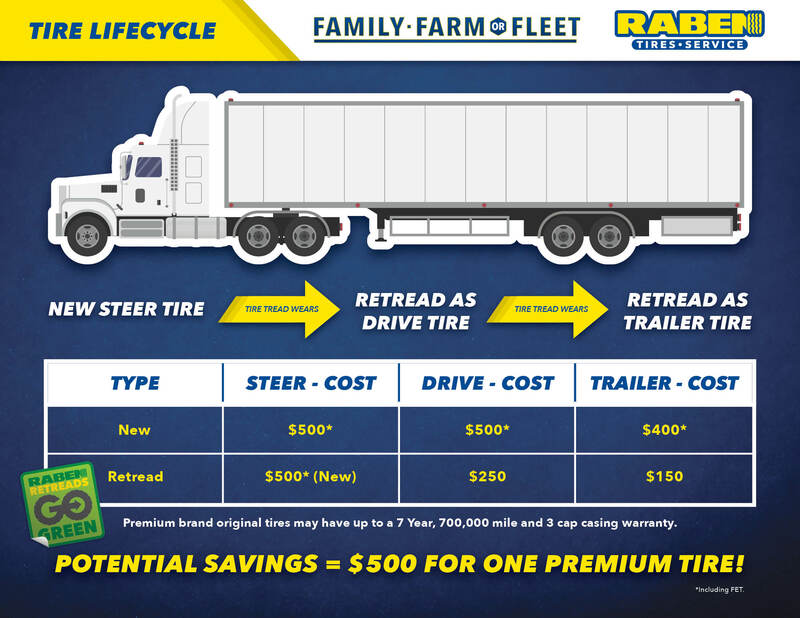 A retreaded tire costs less to produce than a new tire and sells for less. By using retreaded tires, the commercial and military aircraft industries save more than $100 million a year. Retreading truck tires saves the trucking industry over $3 billion each year. Retreading is an effective way to lower your tire costs too. Retreaded tires are such a good value because most of the manufacturing cost of a new tire is in the tire body or casing. The tread (the portion of the tire that meets the road) represents only a percentage of the new tire cost. Today’s steel radial commercial truck tires are an industrial product designed to provide multiple tread lives over the life of the casing. This useful casing life is monitored and managed closely as tires are the number one maintenance cost of operating commercial vehicles. Casings are inspected on and off vehicles at many points in their lives. When a tire becomes worn and seems ready for discard, the bulk of its cost remains unrecovered. In fact, the tire’s useful life has hardly begun. Retreading is very environmentally friendly and conserves oil. The manufacture of a new medium truck tire requires approximately 22 gallons of oil, but it takes only seven gallons to retread. Every year in North America, the use of retreads saves hundreds of millions of gallons of oil. Also millions of tires that would end up in landfills continue their useful lives for thousands of more miles. Retreaded tires in all applications have consistently demonstrated the same reliability in operation as new tires. Many trucking fleets plan their new tire purchases with the intention of having their worn casings retreaded two or more times as a routine part of their tire budgets. Today, in North America, there are as many retreaded tires in operation as there are original tread life tires. Retreaded tires are used safely every day on airplanes, school buses, fire engines, ambulances, trucking fleets and military vehicles.